Until about a week ago, Ethiopian Cuisine was a totally new concept to me. When I moved to Greensboro, I started eating my way up and down West Market Street, home to several international restaurants. A friend and I deemed the first Thursday of each month our very own "International Food Day." 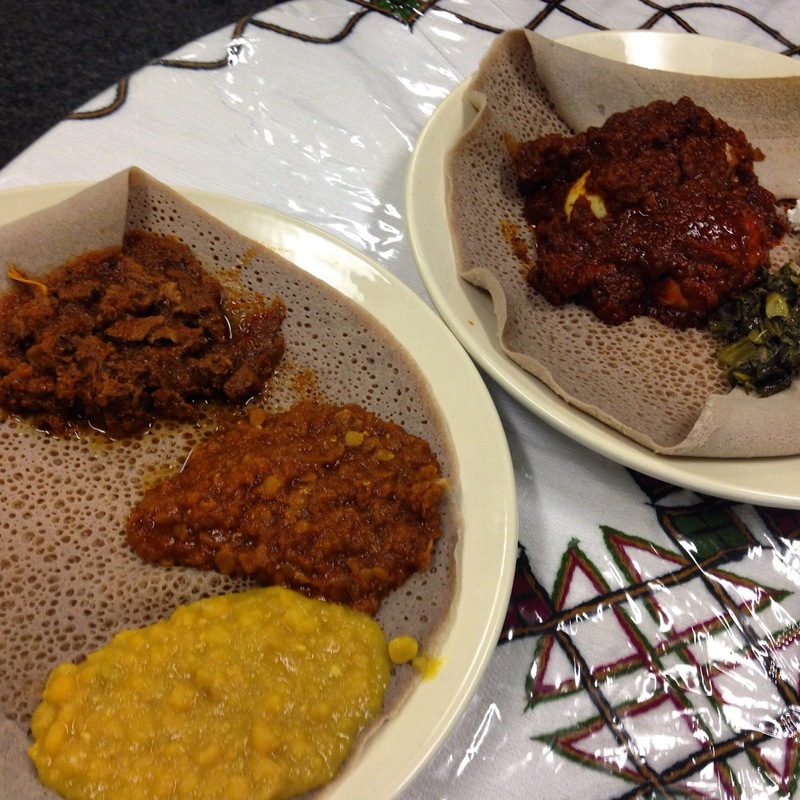 I missed Ethnosh's visit to Taste of Ethiopia, so I knew it had to be at the top of our list. The restaurant is a quaint, tucked away spot off West Market, with thoughtfully crafted artwork and handmade tablecloths. Flavors reminded me slightly of those you'd find in Indian cuisine, so if you're a fan, you definitely need to pay Taste of Ethiopia a visit. Ethiopian cuisine is usually eaten with your hands. Provided we were offered cutlery, I opted for the more traditional method and used my paws. Ethiopian Coffee is no joke. It comes in a delicate little pot, but don't let that mislead you - it's brewed dark and strong. I saw the word "Wot" all over the menu, which is a stew or curry prepared with different veggies and meats. Kay Sega Wot is tender beef cubes marinated in red wine and spices, then finished in a red pepper sauce. The meat is unbelievably tender, and you'll want to get every last drop of the savory sauce. Good thing each dish is served with Injera, a spongy, yeasty, sour tortilla-like bread. I'd never had anything like this. I ordered an extra one. Look at that spongy Injera "plate"! Doro Wot is sweeter and less hot than the Kay Sega Wot, presenting white and dark meat chicken that's been marinated in lemon juice, ginger and garlic, then finished with a red pepper sauce. The Hard Boiled Egg that comes with this dish is memorable, as are the vinegary Collards and what reminds me of Farmer's Cheese. Noteworthy sides are Miser Wot, Red Lentils in a red pepper sauce (the sauces all have varying levels of sweetness and heat!) and Kik Alicha, Yellow Peas in a turmeric sauce. It's hard to pick a favorite - they're all unique and present a different flavor profile when you pair them with the slight sourness of the Injera. The Yebig Tibs (lamb with rosemary, tomato and jalapenos in a hot pepper sauce) is screaming for me to return. This was a truly wonderful meal and experience.